Red roses are a Valentine’s classic but there are plenty of interesting alternatives for something a little different. Valentine’s Day means flirty cards, decadent chocolates, and pink and red hearts galore, but it hasn’t always been celebrated this way. What is now considered a romantic holiday holds deep, traditional roots. Each country tends to celebrate differently and while traditions hold fast, they vary wildly all over the world. For example, in Japan women are expected to give chocolates to men, while in Finland the day is a celebration of friendship. An ancient Eastern European proverb states that “Saint Valentine brings the keys of roots,” which may be one reason why flowers and plants have always been a part of this love-centric holiday. Flowers are a sign of fertility, love, and marriage, so it is no wonder gifting flowers on this heartfelt day has always been popular. This tradition lives on even as Valentine’s Day shifted away from its religious roots to focus on appreciating others in your life and showing love. Valentine’s Day is not just about romantic love; it is also a day to send messages of affection to friends and family. We like this idea as it means we can send gratitude to all our loved ones, romantic or otherwise. Who doesn’t love a token of appreciation or a bouquet of flowers ‘just because’ on a special day? 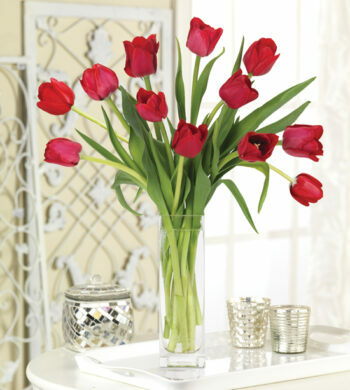 Still romantic and red, tulips provide a fresh take on a traditional palette. 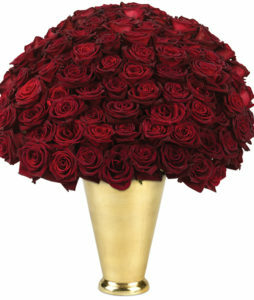 Often when one thinks of Valentine’s Day flowers, the first thing that comes to mind are swoon-worthy red roses. 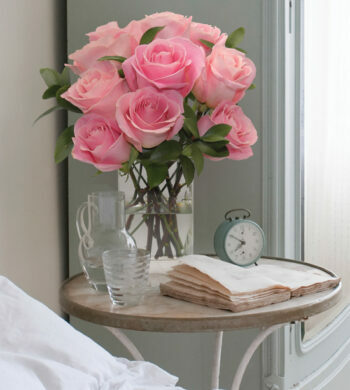 Roses are the most popular flower for this day as they signify romance and passionate love. This thorny flower has also long been considered the favorite flower of Venus, the Goddess of Love. However, there are other gorgeous flowers for your Valentine’s Day sweetheart if you’re looking for something a little outside the box. If you’re looking for something on the flirty side, tulips are sweet, cheerful flowers that often signal the coming of Spring. 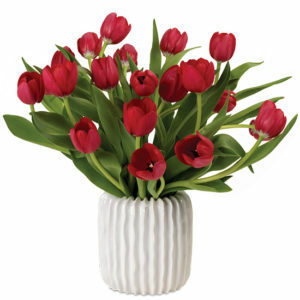 Red Dutch Tulips are a beautiful alternative to red roses as they are still a traditional color for this romantic holiday, but also create fresher silhouette for a distinctive Valentine’s bouquet. 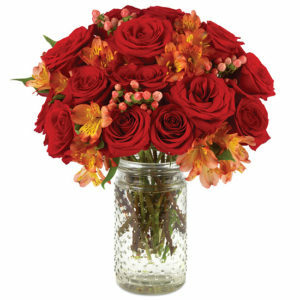 Our English Garden Escape Bouquet is a perfect example of using different colors for Valentine’s Day. Bells of Ireland make a striking alternative to the more standard Valentine’s colors. The fresh, Granny Smith apple green breathes new life into the red and pink palette we all know so well. Bells of Ireland are often used in wedding arrangements and bouquets, as they are a wish of good luck. We’ve included Bells of Ireland in our English Garden Escape Bouquet for both their sweet message and their spectacular texture. 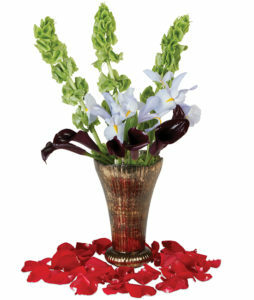 This is a bouquet that is perfect to send to a loved one in a budding relationship or taking a new turn in life. 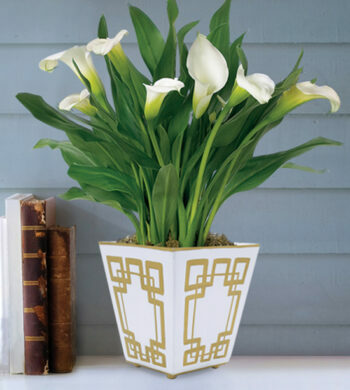 The Bells of Ireland pair gorgeously with deep purple Calla lilies and light-colored irises, another popular Valentine’s flower. This combination creates a bouquet that is still romantic yet strikingly different from the classic pinks and reds. Alstroemeria add a unique touch as a bright and cheery accent flower. 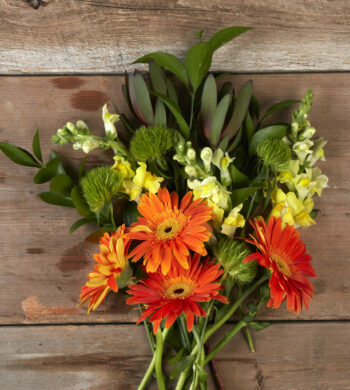 Alstroemeria are another flower that symbolizes friendship and devotion, making them perfect for giving to both new acquaintances and life-long companions alike to show how much they mean to you. A type of lily, Alstroemeria flowers come in various colors and shades, often all in just one bud, making them a wonderful accent to any bouquet, particularly as a highlight to roses. Our Romance Roses are a great example of how Alstroemeria can add a unique touch to a more traditional bouquet with its bright yellows and oranges, creating a friendly rather than romantic bouquet. We hope that you’ve been inspired to explore different possibilities for your Valentine’s Day arrangements, and that you feel loved, cherished, and hopeful, no matter where you stand on this day of love. Happy Valentine’s Day!